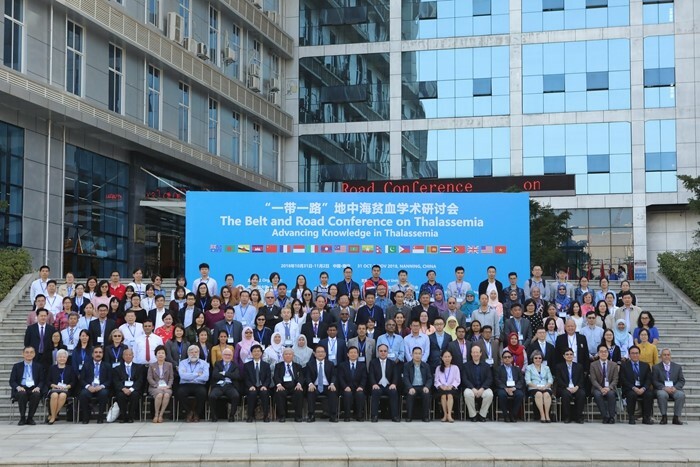 Emeritus Professor Dr Cheong Soon Keng, Dean of the Faculty of Medicine and Health Sciences (FMHS) led a group of lecturer and postgraduate students attended the Belt and Road Conference on Thalassemia from 31st October to 2nd November 2018 at the Guangxi Medical University, Nanning, Guangxi, P. R. China. The lecturers, namely Emeritus Professor Dr Boo Nem Yun, Professor Dr John Paul Evangel Judson, Professor Dr Lam Sau Kuen, Professor Dr Swaminathan a/l S Manickam, Associate Professor Dr Robert Chen and Associate Professor Dr Thaw Zin along with five postgraduate students, namely Dr Shwe Sin, Dr Wong Jun Leong, Ms Erica Choong Pei Feng, Ms Tan Yuen Fen, and Ms Tai Li Hui. The objective of the conference was to update the current and future diagnostic and therapy approaches on Thalassemia and strengthen further collaboration among physicians/scientists in the region. A wide range of topics were discussed during the conference which included laboratory diagnosis of thalassemia, iron metabolism and secondary iron overload, gene therapy for thalassemia, novel approaches for prenatal diagnosis, stem cell transplantation, and update in thalassemia prevention and control in Asia. Our postgraduate students Dr Shwe Sin and Ms Tai Li Hui had presented their respective research poster at the conference. 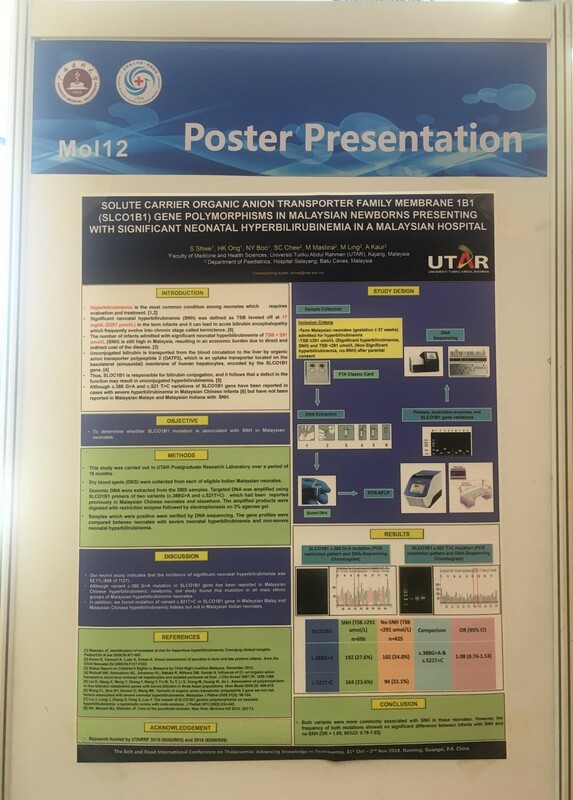 Dr Shwe Sin presented a poster about Solute Carrier Organic Anion Transporter Family Membrane 1B1 (SLCO1B1) Gene Polymorphisms in Malaysian Newborns Presenting with Significant Neonatal Hyperbilirubinemia in A Malaysian Hospital. 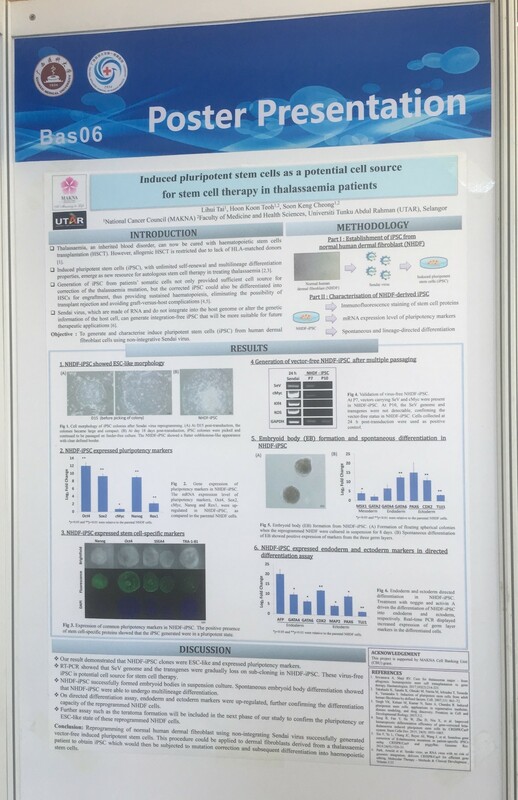 Ms Tai Li Hui’s poster was about Induced Pluripotent Stem Cells as A Potential Cell Source for Stem Cell Therapy in Thalassemia Patients. 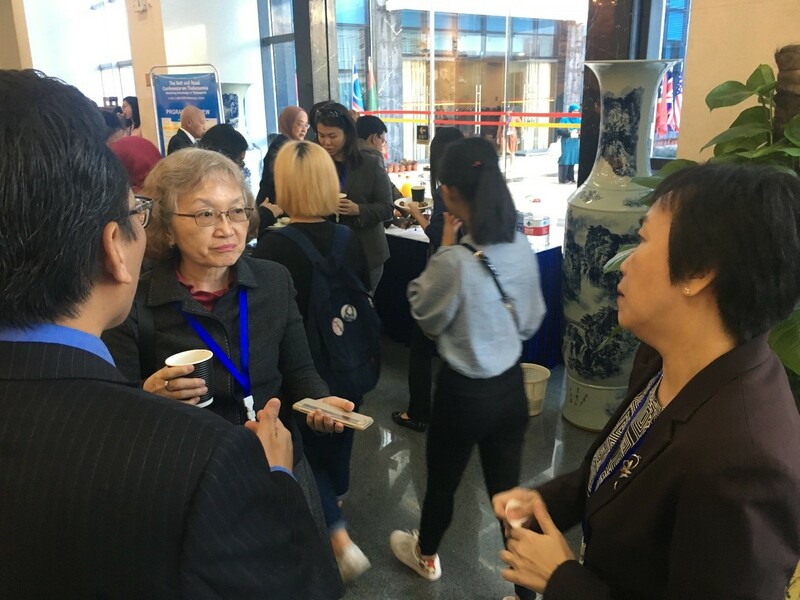 Emeritus Professor Dr Cheong Soon Keng co-chaired the key plenary lectures on the first day with Emeritus Professor Dr Suthat Fucharoen from Mahidol University Thailand (Chairperson, Scientific Committee). The conference ended with a symposium to update delegates on the achievements made by Thailand, China, Indonesia, Malaysia and Vietnam in thalassemia prevention. The prevention and control programme undertaken by the Chinese team fully backed the central government was most impressive and would serve as a model for others to emulate. The symposium was followed with a roundtable discussion among the delegates. It was recognised that collaboration is the way to go for controlling thalassemia worldwide. Forming the Asian Thalassemia Training Centre based in Nanning, Guangxi, China is a step forward. Overall, the participants benefitted from the conference on thalassemia regarding advances in the laboratory diagnosis, successful gene therapies for curing the disorders, novel approaches for prenatal diagnosis, impressive outcome of haemopoietic stem cell transplantation, and effective control measures available.